The province of Cebu is said to be the Gateway to a Thousand Journeys. And right in the center of this so-called gateway is the Queen City of the South, Cebu City. And the title is not without weight; Cebu City is the oldest city in the Philippines and the first capital of the country. This is where the Spaniards first settled after landing at the nearby Mactan Island, making it the fount of Christianity in the Far East. The whole of Cebu—its mainland and 167 islands—is divided into nine cities and forty four municipalities; thirteen of these, including Cebu City, are consolidated as Metro Cebu. With a combined population of almost three million people, it is the second most populous area in the country. 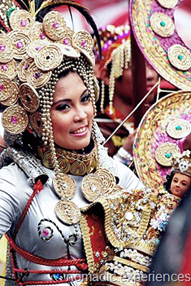 Cebu City and the whole of Cebu is one of the most visited tourist regions in the country. The city and the countryside is teeming with historic colonial architecture, its coastlines are replete with fine white sand beaches, and its interior can surprise the curious traveler with waterfalls, canyons, and mountains to discover. And besides that, they pride themselves for having the best roasted pig or lechon in the whole archipelago. A trip to Cebu can be overwhelming for the first time visitor. The city itself already presents a lot of places to see, but extend your horizon further, and you’d find a lot more areas to explore on far-off towns and islands. 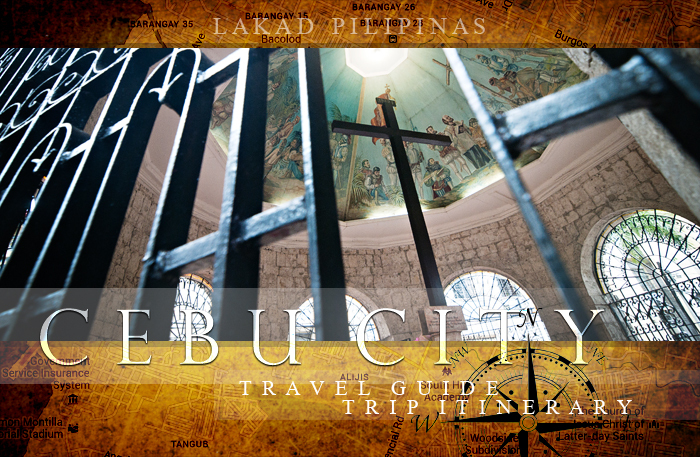 A travel guide can definitely help in planning the perfect Cebu trip for you. Cebu City is the second busiest airport in the Philippines. It is about one hour away by plane from Manila and its airport, located at Lapu-Lapu City on the nearby Mactan Island, is about an hour away from the city center. There are a lot of daily flights, both local and international, coming in at Cebu and the fare is generally very affordable. There are also ferries servicing the port of Cebu City to other parts of the Philippines; from Manila, Visayas, up to Mindanao. The easiest way to get to the city center from the airport is by taxi. There is a dedicated taxi lane just outside the airport, with passengers having the option of having a regular taxi or a yellow airport taxi. Uber and Grab services are also available in Cebu City, which you can connect to via Mactan Airport’s free wi-fi service. Prepare to pay at least PHP200.00 to PHP300.00 upwards for these services. For cheaper options, one can take the MyBus shuttle to SM Cebu City. The fare is only PHP25.00, but they don’t accept cash, you’d have to purchase a MyBus card at the terminal for PHP200.00 (with initial load of PHP100.00). You may use your remaining balance to pay for your ride back to the airport. Should you want to get to Cebu City from the airport by commuting, you can ride a multicab to Marina Mall from the airport. From Marina Mall, cross the road and take a Park Mall jeep. Once at Park Mall, take another multicab heading to downtown Cebu City. There are a lot of jeepneys at the terminal so tell the dispatcher where you’re heading and ask for the right jeepney to board. Another option once on the opposite road of Marina Mall is to hail a Mandaue Highway jeepney. Ask to be dropped off at the corner of A.S. Fortuna near Jollibee. Then take an Ayala Mall bound jeep. From there, take the jeepney bound downtown. Fare for jeepney is at PHP8.00 per person. The main modes of transportation in Cebu City are the jeepneys and multicabs; the latter are like jeepneys, but smaller. Minimum fare is at PHP8.00. Signboards in Cebu are a bit complicated, using codes instead of destination names. The best way to go about commuting in the city is by asking before boarding. Google Maps can also be helpful, the routes are surprisingly updated. If you’re going to the far-away towns in Cebu, they have two central bus terminals just for that. Go to the North Bus Terminal if you’re bound for Bantayan and Malapascua Island. Head over to the South Bus Terminal if you’re traveling to Oslob, Dalaguete, and Moalboal. Take note that traffic in Cebu City is somewhat like those in Manila; avoid the rush hour, and you should be fine. There are a lot of tour agencies offering city tours and daytours of the nearby towns around Metro Cebu, but all of these can actually be done DIY-style. If you prefer sitting in the comfort of an air-conditioned car without having to research and plan your route, then this is definitely the perfect way to tour Cebu. And speaking of convenience, the easiest and the most hassle-free way to do this is by booking your tours online. Most people in the province of Cebu use Cebuano to communicate. It’s the second most popular language in the Philippines and is commonly used in Central Visayas, parts of Eastern Visayas, and Mindanao. Here are a few phrases worth remembering when visiting Cebu. Cebu City has a lot to offer when it comes to traveler accommodations, they have the gamut from backpacker hostels to five-star luxury hotels. For those wanting the sea right outside their doors, Mactan Island, which is about an hour away from the city center, has a lot of resorts offering beachside lodgings. Book in advance, especially during Sinulog season (like, a year in advance, no joke), since most accommodations run out faster than you can exclaim Pit Senyor! The best area to stay in Cebu City is around the downtown area. People go to Cebu not only for tourist spots but also for food. Cebuanos boast of having the best lechon in the Philippines, and rightly so. So far, the best one I’ve had was in Cebu, not in Cebu City per se—although they also serve mean ones—but at the City of Carcar. But enough about roasted pigs. The city also has numerous interesting places to dine in; they have everything you can think of, plus a few more. Some restaurants offer not only good food, but excellent and unique views as well. Cebu City and the towns along the province provide a variety of tourist spots travelers can visit. From the historical circuit in the city, the beaches off its coastlines, its cool mountainous retreats, and nerve-wracking canyons. It’s like an all-in-one package; everything for every type of travelers. When in Cebu, you can actually have your lechon and take it home too! Yes, the best things to bring home after visiting Cebu aren’t cheeky souvenir shirts and ref magnes, but lechon. If you have space to spare, check in packs of Carcar chicharon and packets of dried fishes—just make sure it’s sealed tight, it stinks like heck. And if ever you have more than the usual baggage allowance, why not bring a guitar too! The city has a tradition of producing quality guitars since Spanish colonial times. Cebu City’s historical places can actually be toured in a single day. But if you’re planning to visit the mountainous area of Busay or do an island hopping adventure in Mactan Island, you’d have to extend your tour to at least two days; perfect for weekend travelers. But be aware that your Cebu itinerary would be a really hectic one. It would be a lot better if you can spread your vacation to at least three days. You have to have time to eat lechon too! The best way to explore Cebu though is by allotting at least five days. That way, not only would you be able to see the city sights, but would also be able to go farther to its far-off towns. If you’re into beach get-aways and canyoneering adventures, definitely file those leaves before heading to Cebu. Thanks, ma'am! 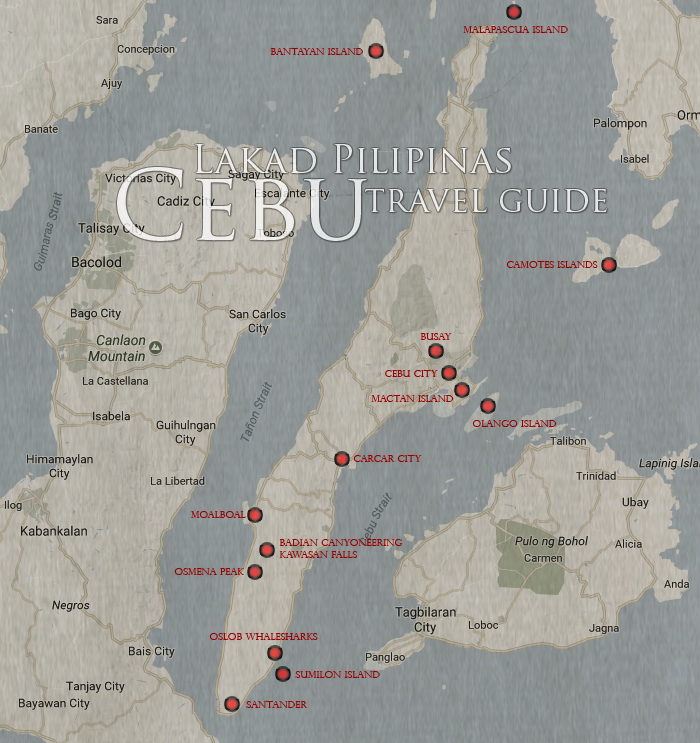 Hopefully it can help travelers planning a trip to Cebu! Thanks for your Cebu hotel contributions! Hi Hazel, thanks for the info! Were you able to see the meteor showers from Cebu? Great Photos! We really love to go to Canyoneering but the last we planned did not happen. I think this time will. Hopefully! Thanks for this. Haven't tried canyoneering in Cebu yet, I don't think I'm physically prepared for it, lol. You just got me super excited planning my trip to Cebu! !! No problem, Mick! Enjoy your Cebu trip! Very informative guide. 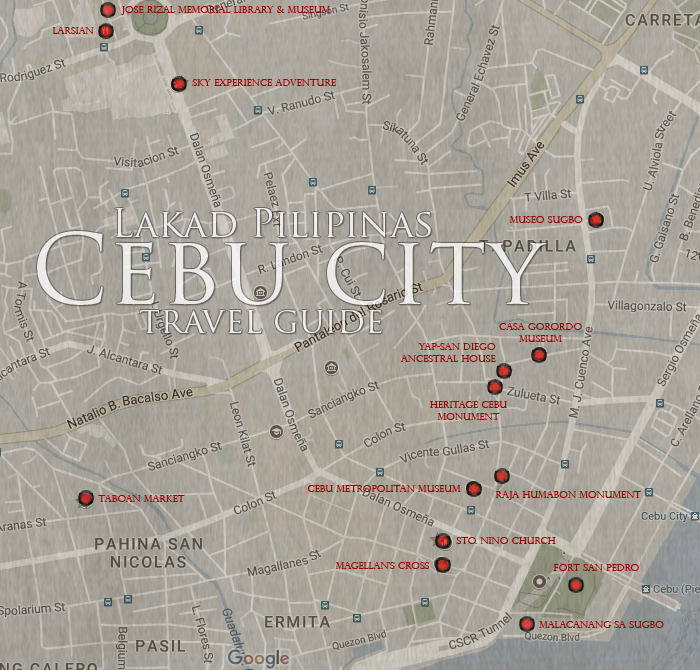 This will help travelers who don't know how to travel in cebu. I would love to share this travel guide to my clients! No problem, Jhann! Enjoy your Cebu trip! This lovely guide is very useful in travel manners especially for Cebu.